Judy Russell of The Legal Genealogist came up with a fascinating chart of her ancestors causes of death and ages at death. It's so perfect for Hallowe'en that I decided to create my own. It was actually a good exercise because I realized that I didn't have all the death registrations and that I hadn't really thought about their deaths. Was there a pattern? Did my ancestors have similar, perhaps genetic, health issues? Did they die young? Live to ripe old ages? Lots of my female ancestors lived long lives, into their 80s and 90s. That's good news for me! With no further ado, here's my Hallowe'en Death Chart. You might want to create one too. The upper case initials on each line are just to help me keep it straight as to whose information I was entering. I encountered a lot of bad transcribing which of course impacts on our ability to find our ancestors. From talking to other researchers yesterday I know many genealogists were finding errors that made it very challenging to find an ancestor. I'm still happy that the index is online and I'm really pleased that Ancestry has a way for researchers to add corrections. In fact I spent a lot of time yesterday adding my corrections to a lot of McGinnis and Vollick individuals in the 1921 census. You want View/Add Alternate Info. Then just follow instructions to add your correction. Let me give you a few examples and then walk you through how to get around this problem. Edgarton Anson Vollick was found as Edward W. Vollick. His son Harry Leslie Vollick, living with him, was indexed as Mary Lester Vollick. His daughter Lottie May was mistranscribed as Satter Mary. A huge error! WIldcards are your friend. But sometimes they don't work to overcome such things as "Harry" becoming "Mary"
Or Edgarton becoming Edward. You must use 3 letters with the allowed wildcard search so you would have to be very creative and use Ed*r* to pick up both Edgarton and Edward but who would think to do that? My grandfather's brother, Henry McGinnis, was quite a challenge. It took me over an hour of fiddling and trying different searches to find him. He was badly mistranscribed as "Mary McGinne" So even with my standard wildcard search of Mc*g*n*s for McGinnis he was not turning up. I confess it did not occur to me to leave off that last letter of "s"! Searching only under his last name and year of birth +/- 5 also did nothing because I used my standard Mc*G*n*s as the last name. I tried his wife Eunice - using wildcards - but no luck. I tried each of his children in turn. Nothing until I got to his youngest son Russell. Searching for "Rus*" with no last name and just his year of birth +/-5 was a Bingo moment. There they were - in Guelph, Wellington County as I knew they would be - but indexed as McGinne with Henry being Mary, his wife Eunice being Cunice and his children unrecognizable.... except for Russell. Add your correction when you find an incorrect entry! This helps other researchers and descendant. Ooops I neglected to add that you need to check the image first as you need to be sure you are correcting the transcription and not the image. Thanks to Audrey C. for the reminder! I still haven't found my great grandmother Harriet (Hattie) McGinnis. I know she lived in Guelph. I know when she was born (1847). I've followed my own tips and still she hasn't popped up. I even tried searching under her maiden name of King in case she used that. Nada. I tried lots of variations of her surname and even searched just under her first name but still nothing. So today I am going to search each of her children in turn to see if she was living with a married daughter and perhaps written incorrectly under their married surname. I'm also going to try Mattie as a first name in case the "H" was mistaken for an "M"
I'm also going to reverse her first name and surname, just in case.... Wish me luck! 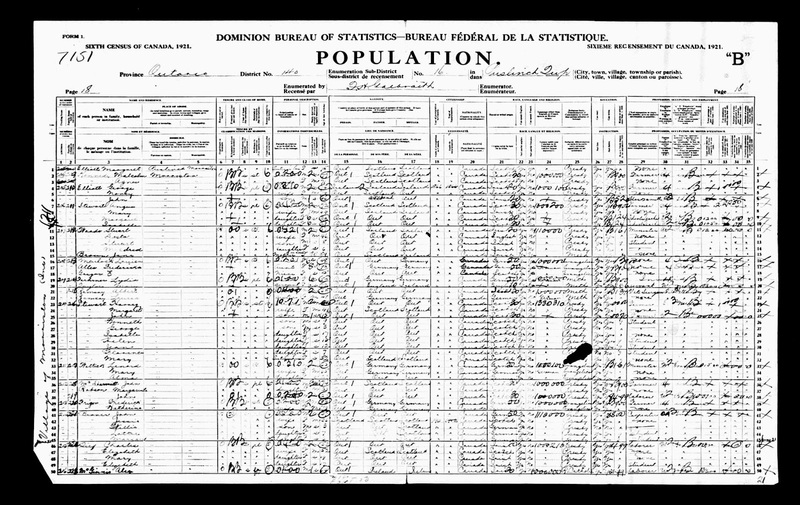 Great News - 1921 Canadian Census INDEX Online! I've already spent a half hour finding family and adding corrections to the indexing. For example my grandmother Olive McGinnis is mistranscribed as "Clive". My father and uncles' names are also slightly mangled. But I'm just happy the index is here! I was invited to the big launch party in Toronto today being put on by Ancestry.ca but sadly cannot attend. It would have been fun and interesting to hear the speakers they are providing. I have been thinking about family and the ones who are gone. This is one of my favourite photos of my mother (on the right) and her sister. It was taken around 1918 in Guelph Ontario. It would be great if I got it restored to get rid of the black photo holders so that will be my next step. Do you have a favourite photo of an ancestor that you keep tucked in a drawer? This one is going in my Shutterfly book about my family. I have quite a few from this time period and really need to get them organized and create copies. A letter from a WW2 soldier was found in the street and the finder is looking for any family member so he can return the letter. The letter was written in December 1944 by Sgt Neal K. Moore while he was in England and it is addressed to Miss Bessie Moore of Galena Park Texas. In the 1940 census for Denison Texas Neal is found as a single man living with his sister, the widow Georgia Armstrong, at 609 East Munson Street. He works in a cheese factory. 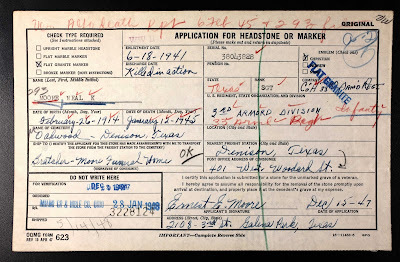 An application in 1947 for a military stone for Neal's grave was submitted by Ernest Moore living in Galena Park Texas. [FN3] I have no doubt he is related, if not to Neal, to Bessie the person Neal wrote to. I plan to continue hunting for more details on Neal and on Bessie the woman he wrote to. My hope is that my wonderful readers will jump in and put on their genealogy sleuthing hats! Oct. 30th : Exciting Update!! Thanks you guys! Thanks to folks from your group we found out about this last night. My mom is the closest living relative to Neal and Bessie and we are now in contact with the gentleman who found the letter and will be seeing it soon! My mom, Donna Moore DeVore, is 76 and this is the most exciting thing to happen for her in a long while. She had only recently posted info on Neal on her ancestry page. Too cool! 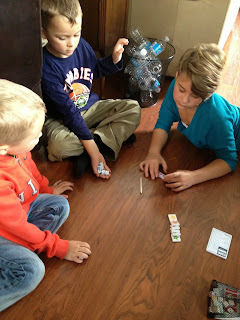 Another winner of a game that my grandchildren loved! 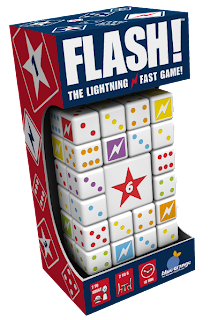 FLASH from Blue-Orange is a game for ages 7 to adult. It's a fast paced dice game for 2 to 6 players. My grandchildren ages 6 to 11 played. The age limits given are accurate as the 6 year old (he just turned 6 last month) had some trouble. There are different challenges to meet. 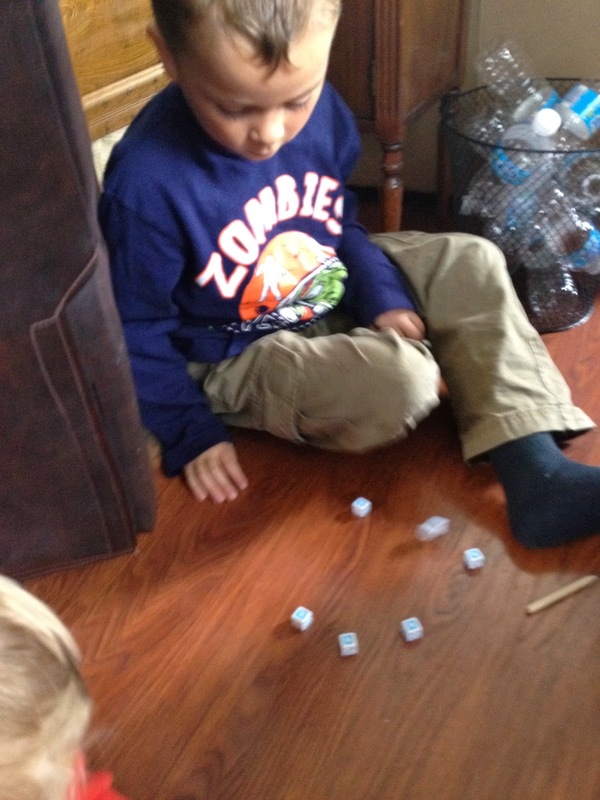 Sometimes each player tries to get 6 of a kind, sometimes it is 3 pairs or other variations of the dice tosses. Players toss their dice, quickly decide which are "keepers" and which need to be thrown again to complete the challenge, then toss again. 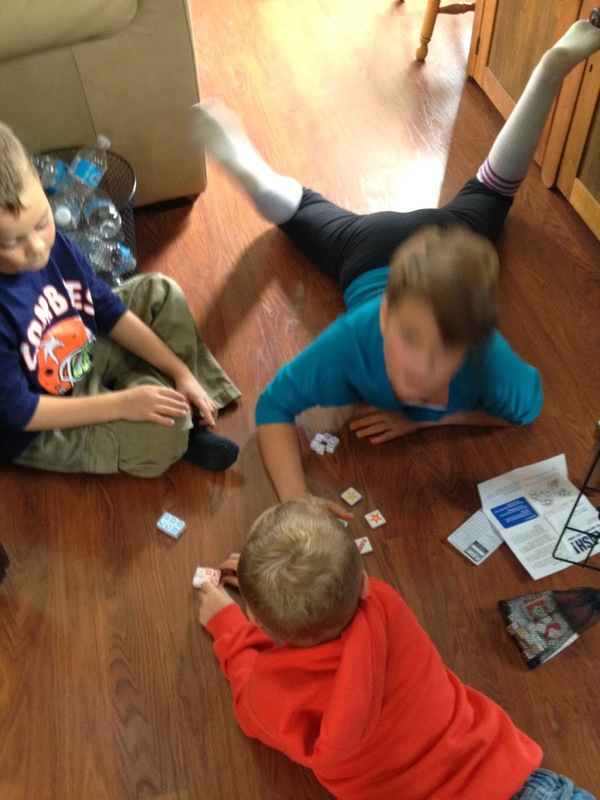 The 6 year old's siblings ended up letting him stick with trying to get 6 of a kind because he had trouble understanding the concept of 3 pairs and the more difficult sets. 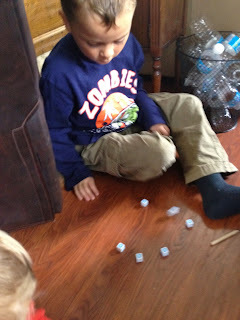 He also had a little trouble keeping up with the fast pace of the game and making decisions as to which dice to keep and which to throw again. 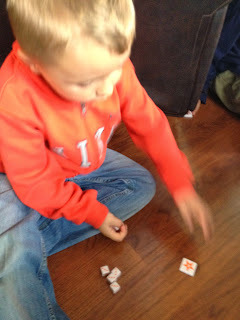 But he enjoyed playing! His older siblings had no trouble at all. They loved the game although they did need a little help from me to understand the rules. But that's good because the point of these games (for me) is to bond with them and spend some fun quality time together. 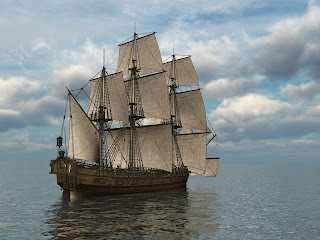 I use these games as a opportunity to talk about history and our ancestors. I say things like "Do you think our ancestors played games like this?" and then we talk about what a child might get for Christmas in the 1800s or what games Great-Grandpa or Grandma McGinnis had to play with. Disclaimer: I was given a free game to review but I was not told what to say. The opinions here in my blog post are my own. Those of us with Irish ancestors know how difficult and challenging it can be to find records. One set of records that is often overlooked is the J & J Cooke Shipping Agents Records. I'm definitely taking advantage of this special and buying a few DNA kits for Christmas presents for family members! We'd like to have hubs' mom and dad tested and I'd like to convince my 102 year old Uncle on my mother's side to do a little spitting! In any case I plan on buying 4 kits for Christmas. The more family members I can get to test, the more accurate results are and the more i can find out about our family heritage. You can choose a plan from every state and county as well as the coverage you need to see a table of costs. Blended Families, Blended Names - Good or Bad Idea? Blended Families, Blended Names is the most disturbing trend I've heard of recently. According to the article online, some married couples are inventing a new surname for themselves and by extension their children. The new surname is a combination of the husband and wife's surnames. This isn't a case of hyphenated surnames. Two of my own grandchildren have a hyphenated name from their mom and dad as their moniker. But that makes it easier for genealogists! Having an ancestor named Smith-McConnell gives an instant surname to the wife and as we all know, often it is the women who are the most challenging to find. No, this is a case of taking husband and wife named Smith and McConnell and creating a new name such as McSmith. The new name is used by the couple and by their children. All I could think when I read this was how difficult they are making life for their descendants who might be interested in genealogy. But I also confess I had a little bit of sadness thinking how that name change dishonoured their ancestors. In my own genealogical research it was only through sheer luck that I stumbled on the fact that my Vollick ancestor who I could not find prior to 1786 was in fact born a Van Valkenburg. Sometime during or after the American Revolution his surname became Vollick. His sons used both Vollick and Follick. I would not deliberately wish that challenge on anyone! Has everyone been noticing the countdown that's been on Ancestry.com and Ancestry.ca for a few weeks now? Every day this ticker counts down. Since 1921 Canadian census has been online and available for browsing but is not yet indexed I think I know what it means - what about you? I have always told my husband he looks a lot like his great-grandfather. He doesn't see the resemblance but to me it's striking - especially in the mouth. What do you think? Do you have an ancestor you think you or another family member looks like? Hubs has a photo of a young girl in his family and it's a bit creepy because she looks just like me! What's your ancestor look-a-like story? DNA Results Leave us Gob-Smacked! That's a British expression. It means dumbfounded, surprised as heck... you get the idea. I've been digging into hubs' DNA matches and results very closely and found a match that is one heck of a surprise. To preface my story, this match (let's call him John) is listed as 64% .64% Sharing and with 47 cM. 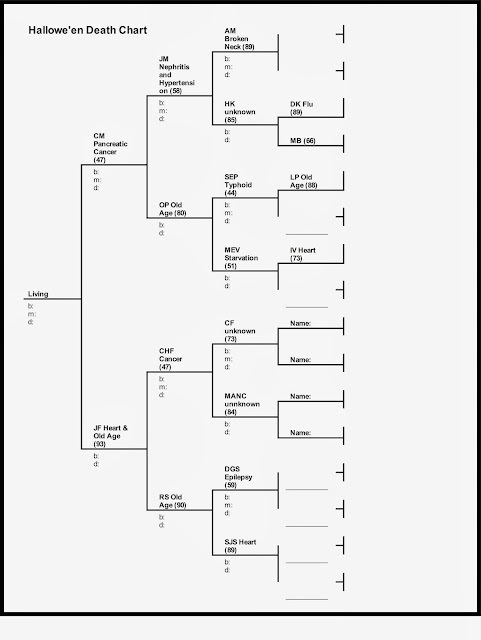 [FN1] That's a pretty close match, I estimate within 3 or 4 generations. The matches that I've been able to confirm as matching me or my brother, are with a shared ancestor going back to 4th or 6th great grandparent - and they only have 20-25 cM matching. So finding this new match to hubs and such a close match was exciting. The puzzler was that none of the match's surnames or ancestral tree are the same as my husband's. And we can both go back quite far with sources to prove the genealogy. So what gives? After scratching my head for a bit I had an "aha" moment. I suddenly realized that one of the match's surnames was the same as the name bandied about as a bit of family lore from hubs' grandmother. Grandmother always claimed that her husband was the son of the hired man and not the son of the man he thought was his father, his mother's husband. We dismissed this as petty gossip on her part. But now, having seen the lineage and done my own investigation, we have a compelling case that supports her claim. I don't want to use names yet so I'm going to make up names for each individual. Great Sally was said to have had hub's grandpa (Alex) by the hired man (Mr. Smith) who was not her husband. We also find that Sally's husband William was living next door to Ralph Smith and two sons in 1911. They were all farmers. Ralph Smith and his sons were all farmers and farm hands. This fits with the story of Great Grandma Sally messing around with the hired man. 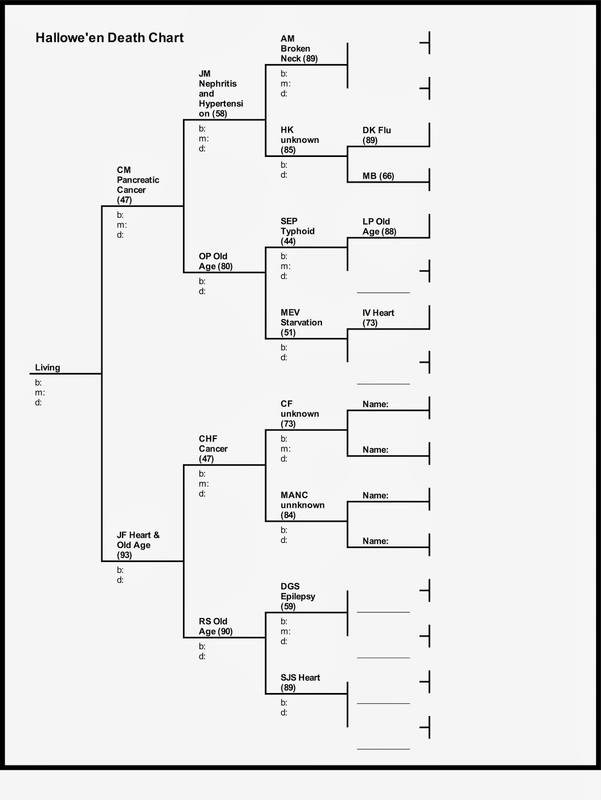 Given the presumed close relationship indicated by the DNA samples, we have a theory that either Man B (our match's grandpa) or one of his nephews (we have a good candidate) was the father of hubs' Grandpa. Now the question is how do we tactfully suggest this to our match (or do we even bring it up??) and how do we gather more evidence. We plan on asking hubs' mother to have her DNA tested through 23andMe.com so we can see if she also matches hubs' match John, and if so, by how much. Hubs is going to join some surname groups for the lineage he thought was his. If he is not related he won't match anyone in those groups. The new match's ancestors were all running around in the same very small community as hubs' ancestors. So there is a chance that the common ancestor is a secret that a wife or mother took to the grave. We would have to test more family members to try to narrow down the shared ancestor. We'd like to get one of hubs' uncles to submit a DNA test if possible. Meantime I'm doing some sleuthing to try to eliminate any possibility that there is a different shared surname and thus ancestor. But it certainly looks like hubs has a new cousin and many new family surnames to research! Mind you this is only in the theory stage, there is no definite proof of what the relationship is to our new-found match. 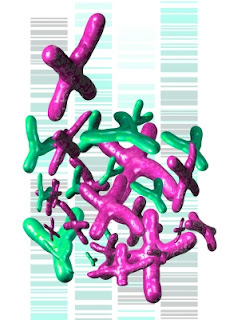 FN1: cM is unit of genetic distance on a chromosome. Closer relationships have longer cMs because recombination has not occurred as often. The following Press Release was received by Olive Tree Genealogy on October 17th but I held off announcing this great news until today. Earlier the website servers crashed due to high traffic as everyone rushed to see their new DNA results. 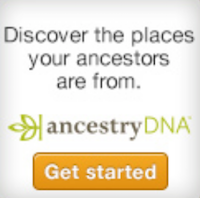 (PROVO, Utah) – October 17, 2013 – Ancestry.com DNA , LLC announced today an update to its popular DNA test. Armed with one of the most comprehensive collections of location based DNA samples from around the world and the latest DNA testing technology, AncestryDNA now maps a test taker’s ethnic origins to 26 global regions, including expanded regions for people of European and West African descent. Whether you’re just getting started researching your family history or you are an advanced genealogist tracking down a specific portion of a family tree where records are going cold, the new update to AncestryDNA can help people explore their ancestry beyond historical records. · Increased number of ethnic regions to 26 from across the globe. · More detailed African ethnicity – a total of 10 African regions, including 6 different countries/regions within Western Africa including Benin/Togo, Cameroon/Congo, Ivory/Ghana, Mali, Nigeria and Senegal. · More detailed European ethnicity, including Ireland, Great Britain, the Iberian Peninsula and Italy/Greece. · A complete user interface redesign with improved visualization tools, regional educational materials and a detailed description of the science behind the results. · Improved science, including extensive testing, validation and an increase in the number of reference populations. · A database of more than 200,000 customers. Last year, with the initial launch of AncestryDNA, a test taker was able to receive results that mapped back to 22 different ethnic regions. Today’s announcement marks an expanded range of genetic ethnicity and geographic origins that is currently not available in other consumer DNA tests on the market. · The journey of many African American’s ancestors can be difficult to research using historical records alone, as most lose the paper trail around the 1870s or before. But now thanks to expanded capabilities that detail African ethnicity into 10 regions, including 6 different countries/regions within Western Africa, AncestryDNA will help people of African descent better understand where their ancestors came from and the cultures of those places, in a way never before possible. · Previously identified as one ethnicity group, the British Isles is now broken down to expanded regions, divided into Great Britain and Ireland. This development provides additional insight to the approximately 21% of Americans who claim Irish or English heritage. · Southern Europe is also now separated into two groups including, the Iberian Peninsula (Spain and Portugal) and Italy/Greece, providing more detail for those with Mediterranean heritage where historical records are less likely to be available. In May 2012, Ancestry.com launched AncestryDNA, a service that analyzes a person’s genome at more than 700,000 marker locations. It is available at Ancestry.com for $99, plus shipping and handling. The price includes a DNA testing kit, genetic lab processing, online results delivered in a private and secure account, as well as continual ethnicity and cousin matching updates. Additional information on AncestryDNA can be found at Ancestry.com . LONDON, England and SALT LAKE CITY, Utah--Annelies van den Belt, the new CEO of DC Thomson Family History, the British-based leader in online family history and owner of findmypast and Genes Reunited, has announced a major new partnership with US-based FamilySearch.org that will give family history enthusiasts access to billions of records online and new technology to collaboratively research their family roots. DC Thomson Family History, formerly known as brightsolid online publishing, is collaborating with FamilySearch, which has the largest collections of genealogical and historical records in the world, to deliver a wide range of projects including digital preservation, records search, technological development and the means to allow family historians to share their discoveries. 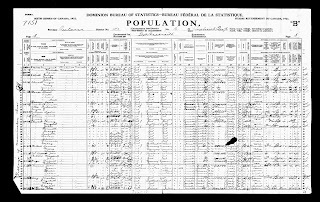 More than 13 million records from FamilySearch.org launched today on findmypast.com, including major collections of births, marriages and deaths covering America, Australia, and Ireland. Around 600 additional collections, containing millions of records, will follow. The two organisations have a long history of working together on historical projects, including indexing 132 million records of the 1940 US census and two hundred years of British Army Service Records (Chelsea Pensioners) in a joint digitisation project with The National Archives. DC Thomson Family History is the British-based leader in online family history, which operates major online sites including findmypast, Genes Reunited and the British Newspaper Archive. It launched in America last year with its findmypast brand. DC Thomson Family History has a strong record of partnerships with non-profit and public sector organisations such as the British Library and The National Archives among many other major archives and organisations around the world. The Unclaimed Property Division of the Illinois State Treasurer’s Office presently has in its care nearly 200 items belonging to past and present servicemen and women. These items include military medals, artifacts, ribbons, and awards spanning more than a century of American conflict. 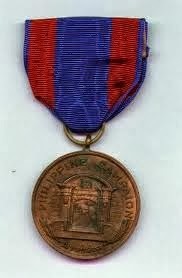 One military medal even dates back to the Spanish American War circa 1898. 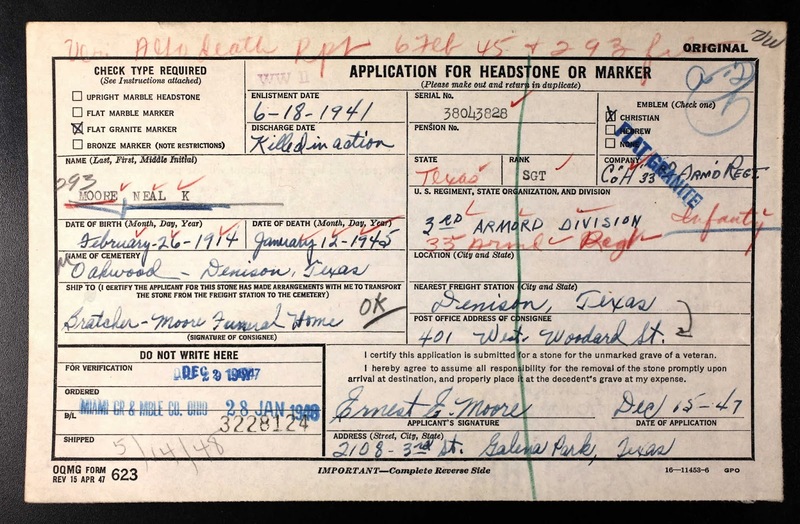 Other priceless items include service records, dog tags and commendations from World War II, Korea and Vietnam. It is the goal of the Illinois State Treasurer's Office to reunite these very important military medals and awards with the men and women who earned them through their great sacrifice and service. Please take a look at the list of names who either were given the medals or who have a connection to the original medal owner. Perhaps you will spot an ancestor or relative! Before leaving, please take a moment to view Olive Tree Genealogy's Soldiers Dog Tag Cases. Some are still unresolved meaning we have not yet found a descendant to send the found dog tag home. 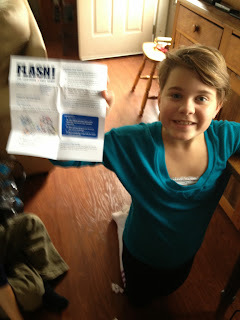 My readers know how excited I am about DNA testing for genealogy (and other reasons). So far I've had results for my own DNA tests from Family Tree DNA, 23andMe.com and the now defunct DNA-me. I loved that 23andMe told me how much Neanderthal DNA I had! I've also submitted a DNA kit to Ancestry.com for testing and my results should be in any day now. Testing with more than one company is important as each company runs a different algorithm to test your sample. So combining all the results gives you a much better and more detailed look at your DNA. So I'm excited to tell you that Ancestry is currently offering Free Shipping with Coupon Code: FREESHIPDNA on all DNA kit orders. Just use the link below to order your DNA Kit today! Caveat: Ancestry does not ship DNA kits to Canada. I happened to be visiting a friend in New York and had mine shipped there. MyHeritage, the popular online family history network, and FamilySearch.org announced today the signing and commencement of a strategic partnership that forges a new path for the family history industry. Under this multi-year partnership, MyHeritage will provide FamilySearch with access to its powerful technologies and FamilySearch will share billions of global historical records and family tree profiles spanning hundreds of years with MyHeritage. This will help millions of MyHeritage and FamilySearch users discover even more about their family history. FamilySearch will provide MyHeritage with more than 2 billion records from its global historic record collections and its online Family Tree. These records will be added to SuperSearch, MyHeritage’s search engine for historical records, and will be matched with family trees on MyHeritage using its matching technologies. MyHeritage users will gain access to an unprecedented boost of historical records and family tree profiles, which are key to researching and reconstructing their family histories. This reinforces MyHeritage's position as an international market leader, with gigantic assets of family trees and records, which are the most globally diverse in the industry. Toronto Star Archives, formerly Pages of the Past, has free access to their Newspaper database until October 15th. This weekend is the Canadian Thanksgiving weekend. We are having our Thanksgiving supper today and will be joined by my son, daughter-in-law and four of my 10 grandchildren. Also joining us are two friends. Most of my planned meal is prepared and just waiting to be heated slowly in crockpots and microwaves: two turkeys, stuffing, candied yams, mashed potato casserole, Butternut Squash soup, green bean-mushroom-onion mix, Caesar salad, Kak's cukes, and for dessert Carrot Cake with Cream Cheese Icing. Thanksgiving in Canada isn't celebrated for the same reasons as in America. No pilgrims here! But we celebrate a bountiful harvest and good times with family and friends. What are you doing for Thanskgiving? What are your family traditions? 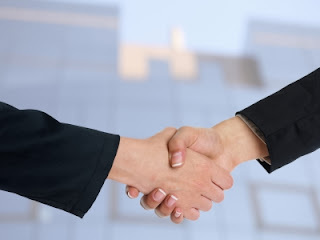 Google has started something called Shared Endorsements and unless you change your Google account settings your photo and name can be used beside online ads. Shared Endorsements is used to help your friends find things you have liked. So for example if you read a news story or watch a YouTube video and you click "Like", Google has the right to put your photo and name from your Google account in an ad related to that item. It's easy to opt out if you don't like this idea - just log in to your Google account and go to Shared Endorsements then untick the radio box labelled "Based upon my activity, Google may show my name and profile photo in shared endorsements that appear in ads"
These new Terms of Service are also in effect on Google + and apply to Google's use of your Page's name, photo and actions. To opt out of having your name and photo used, you must log in to your Google + Page account first. Note that you can access this setting from your Page's Dashboard. If you turn the setting off, you may not be able to use certain features until you re-enable it. YouWho - New Genealogy Website Sounds Intriguing! YouWho.com sounds intriguing! It's a new Genealogy startup website co-founded by two former Ancestry.com executives. The premise is that YouWho gathers old photographs, both from outright purchases and from visitor uploads to the site. Through facial recognition software and visitors' tagging of individuals in the photos, YouWho will find descendants. Their slogan is "YouWho will show you who you are"
YouWho plans to allow visitors to upload documents, photographs and other memorabilia to the site. It can be public or private and according to a YouWho video, users can also sell copies. That sounds great, I mean we'd all love to be tracked down and told there's a photo or letter online of one of our ancestors but that's a tall order! We'll just have to wait and see. Olive Tree Genealogy will keep you posted when there is anything new to report. I just registered online for my home page on the site. I'm certainly intrigued even though their welcome popup was a little "cute" for my taste! Meantime why not visit my Lost Faces website where I have published almost 3000 photographs from the mid 1800s. Some are identified, some are not but you may find an ancestor or two there. There are also letters on my site Past Voices so pop over there too and see if you can find an ancestor's letter in the collection. Do You Want to be on Genealogy Roadshow? Here's How! If you've ever wanted to be on the new PBS series Genealogy Roadshow, now's your chance! The producers are calling for submissions for the 2014 season. Uh-Oh I Hear Cries of "The Sky is Falling!"